First off I must apologise to those of you that had subscribed to my fortnighly updates of #SciFri – sometimes I just don’t have anything to write about or in the case of TetZooCon, I have postponed the blog for the following week in order to bring you something truly magical! Also sorry for the terrible quality of some of the photos. Many of you would have been aware of the happenings of TetZooCon 2018 due to both Darren’s posts everywhere (and I mean everywhere) and also because #TetZooCon was trending on Twitter through some networks. So for those of you that don’t know – TetZooCon is an annual event where a number of scientists, palaeoartists and general enthusiasts get together to celebrate all things tetrapod. The name stem’s from Darren Naish’s blog Tetrapod Zoology (or Tet Zoo for short) which I urge you to go and check out! This year’s TetZooCon held on the 6th and 7th October was bigger and better than ever before! First off it was a two-day event instead of the one and there were even parallel sessions (but I’ll come back to those later). TetZooCon has been an annual event for 5 years now so instead of breaking out the wood themed presents – there was even a post-conference field trip to the Crystal Palace Dinosaurs (which I’ve written about before), which I shall also mention in more detail in a future blog. The line-up of talks were wide-reaching in both their subjects and conservation/scientific implications. Something that was mentioned a couple of times that seems to have held back the course of the science slightly is the allied bombing of Germany in the WWII – destroying a number of precious museum specimens which we can no longer study. 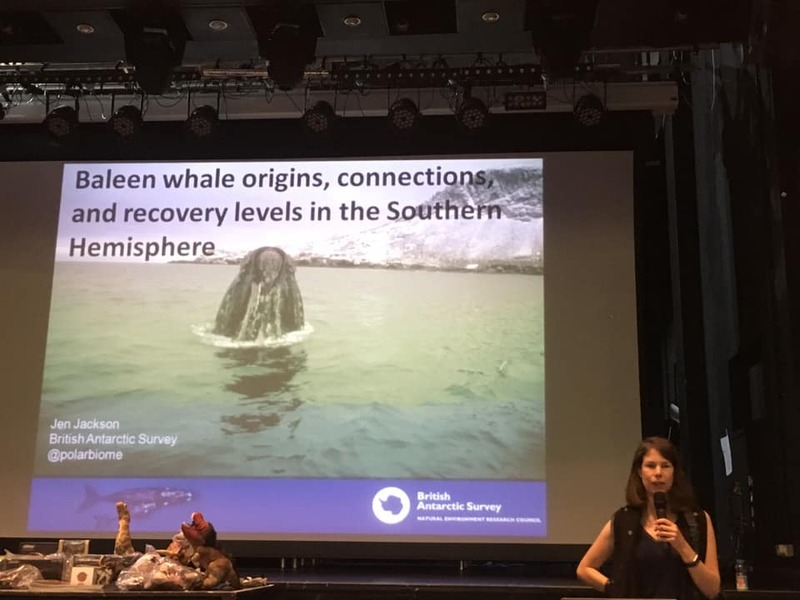 That aside, my favourite talk of the event was that given by Jen Jackson on the origins of baleen whales and their recovery in the Southern Hemisphere. As you’re probably aware, I don’t study whales and I don’t often think about them unless they are featured in a nature documentary. So why did I enjoy this talk so much I hear you ask? Simply it was spectacular, it contained literally everything about baleen whales: their evolution, conservation, life history and the list goes on. Everything was summarised perfectly to ensure that so much information could be delivered in such a short space of time but importantly is was also accessible. Apart from learning a lot about whales, I’ve also took home some pointers and ideas on how to improve my own presentations for the future. There are two talks that come in a tied second place and these were ‘The Truth About Animals’ a talk given by Lucy Cooke about here new book and ‘How Do Bird’s Tell the Time?’ by Robyn Womack on her PhD research. I’ve been following Lucy’s adventures for a while ever since I discovered her blog back in 2011ish titled The Amphibian Avenger. Since then Lucy has risen to fame, featuring in a number of BBC documentaries/TV shows and also started writing awesome books. Due to her energy and charisma, Lucy’s talk was both entertaining and factual which really helps to cement ideas a concepts in your head such as the archaic views people had on wildlife and animals back in the Medieval times. Robyn’s talk was all about biological clocks and how our species is affecting the circadian rhythm in songbirds. This is of particular interest to myself as a number of years of late-night bar work combined with nocturnal amphibian surveys has completely shot my biological clock – although I am now getting back into a sensible rhythm. Again, Robyn’s talk was a mix of fact and entertainment which helped to keep people awake whilst their morning coffee kicked in. If you were at TetZooCon, I’d keep an eye on the early career researchers such as Robyn who are about to finish their PhD’s as I can see them going off to do amazing things, I’ve still got a few years to go yet but they are an inspiration! Would this even be a proper blog without a shameless self-promotion? After a few years of being busy in early October either being out of the country or as was the case last year starting my Masters, I was finally free to attend TetZooCon. This was my first one and I thoroughly enjoyed myself. 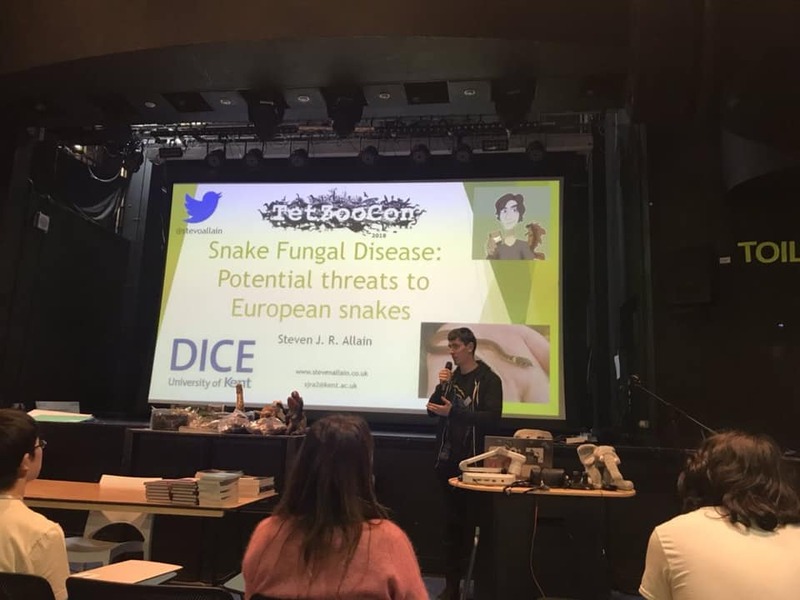 I had the shortest talk of the event (only 15 minutes) but I still managed to pack in a whole host of information and a quick review on snake fungal disease without anyone being the wiser. The reason why I didn’t give a longer talk is because I haven’t collected any data yet, only being a few weeks into my PhD – I’ve got a long way to go yet! Hopefully in a few years I’ll be able to update the TetZooCon community on my research although before then I’d like to talk about my research on midwife toads in the UK. Thanks to all of those who said hello at TetZooCon and asked me questions, I realy appreciated it! If you didn’t manage to catch me there is always next time and if you have no idea what I looked like, I was the guy that looked he just fallen out of 2004. I was also lucky to catch up with the herpetological legend that is Mark O’Shea and chat about his research which was very similar to something I was doing as part of my Master’s Degree at the Natural History Museum. Although I had to part with cash, I also got a signed copy of ‘The Big Book of Snakes’ which is now sitting proudly on my shelf among my millions of other books. To wrap up, I had a great time and TetZooCon 2018 was one of the best conferences I have been to. There was a nice mix of everyone and the atmosphere was less of academic tension and more of family and community. I do have one gripe and that is the parallel session for the palaeoart workshop as half of the delegates attended that and missed a number of great talks (including my own) but I understand the need to do so in order to keep the event on a reasonable timescale. People had to pay extra money to attend the palaeoart workshop so it was their choice, in my mind I’m sure people would have enjoyed the workshop more as not everyone is academically minded (just like I can’t draw to save my life). The icing on the cake was amazing avatar that John Conway produced of me (seen on my name-badge), although I ruined things slightly by having a haircut shortly before the event. 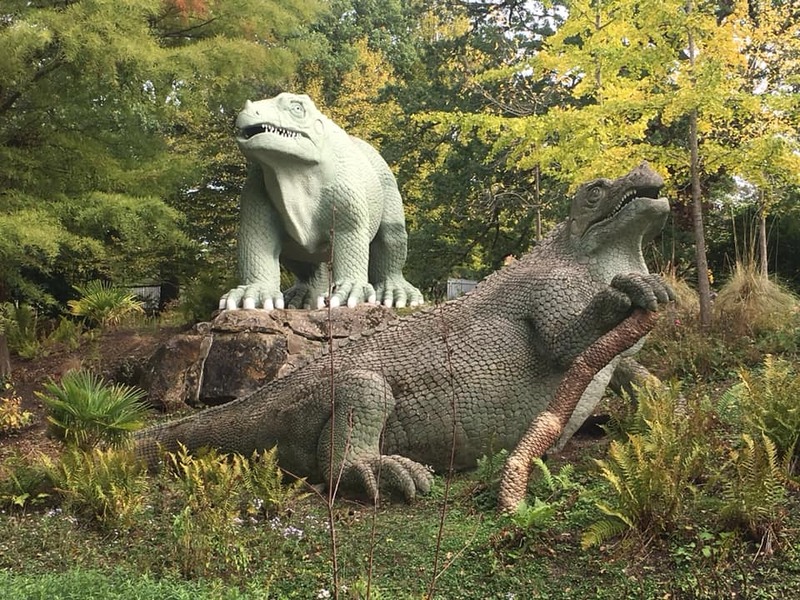 As mentioned above on the Monday (the 8th) a small number of us also visited the Crystal Palace Dinosaurs but I will come back to this in another blog as I think we should be more proud of them than we really are. 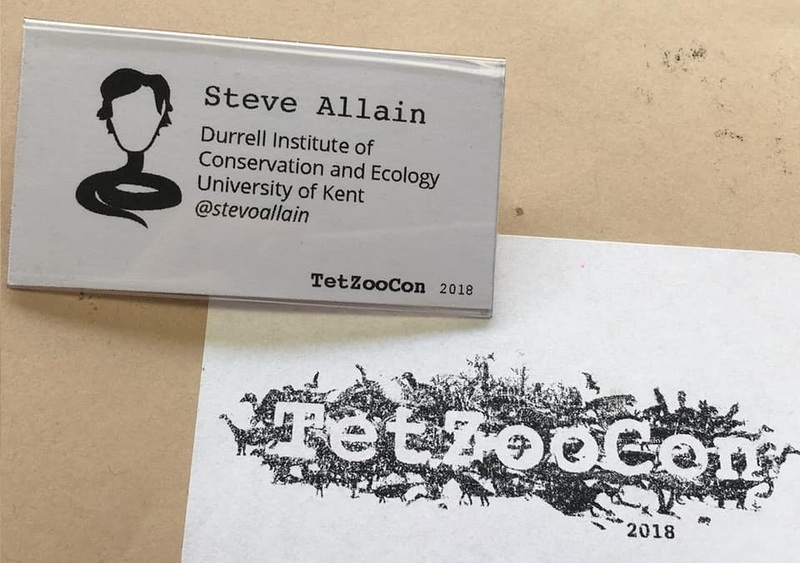 In summary, TetZooCon 2018 was an amazing event, I met some spectacular people and I would recommend the event to anyone who has the slightest interest in tetrapod zoology as it will surely foster and nurture those feelings/interests! Finally I’d like to thank Darren and John for all their hard work, the session moderators, fellow speakers and attendees for making TetZooCon 2018 the momentous occasion that it was!